Oil prices fall for a 10th consecutive session, sinking U.S. crude futures deeper into bear market territory and wiping out the benchmark's gains for the year. U.S. crude prices fell Friday for a 10th consecutive session, sinking deeper into bear market territory and wiping out the benchmark's gains for the year. Crude futures fell for a fifth straight week as growing output from key producers and a deteriorating outlook for oil demand deepen a sell-off spurred by October's broader market plunge. 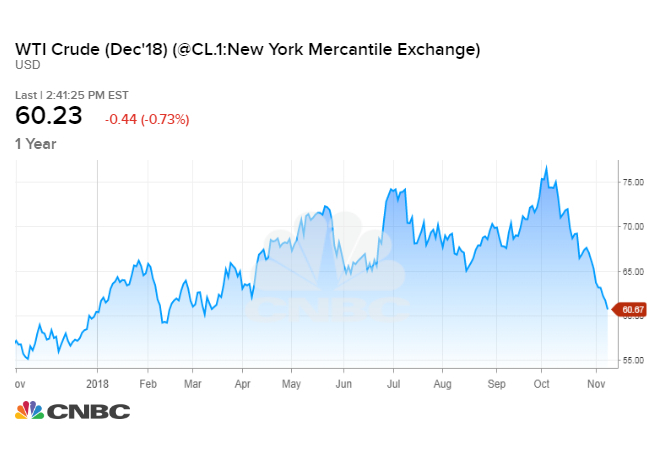 The drop marks a stunning reversal from last month, when oil prices hit nearly four-year highs as the market braced for potential shortages once U.S. sanctions on Iran snapped back into place. "The market's not tight. I think there are windows where you could perceive it to be tight, and I think the markets got caught into that," Christian Malek, head of EMEA oil and gas research at J.P. Morgan, told CNBC on Friday. "The reality is that we're still in a world where we're overproducing and we've got surplus." Oil prices spiked in early October on fears that U.S. sanctions on Iran, OPEC's third biggest oil producer, would thin out global petroleum supplies. However, the Trump administration granted temporary sanctions exemptions to eight countries, allowing Iranian crude exports to continue and easing concern about undersupply. Meanwhile, the world's top three producers, the United States, Russia and Saudi Arabia are pumping at or near records. Other OPEC members and exporting nations are also turning on the taps. However, some analysts think there's a ceiling on U.S. production growth. "I'm not as fearful now that U.S. growth is going to wreck the party like I was a year ago," he told CNBC's "Power Lunch" on Friday. "A year ago I would say 2 million barrels per day growth out of the U.S. is possible. I don't think that's the playbook anymore." "This monitoring committee is important, but it looks like consensus is likely to build around what Russia and Saudi decide, and that gets institutionalized," J.P. Morgan's Malek said.